We have another marathon of a day today, but I promise it will be awesome! Buckle your seat belts. We're going for a ride to Montserrat, a mountain range in Catalonia which translates to "serrated mountain." 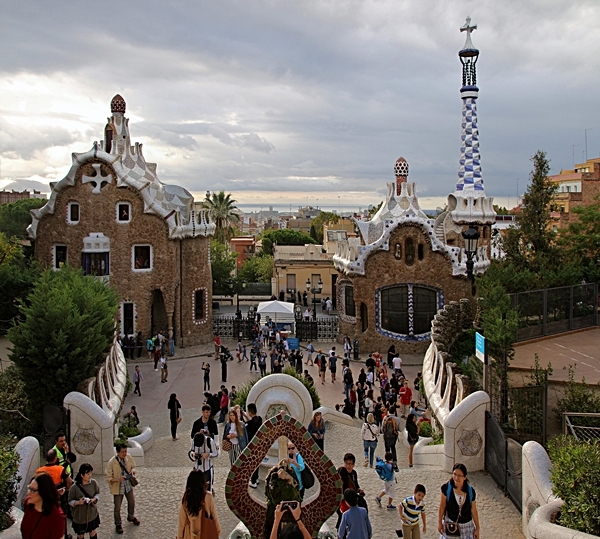 We booked this approximately 7-hour-long Montserrat, Tapas and Wine Half-Day Tour. The tour's actually conducted by Castle Experience Wine Tours, although I just checked their website, and it looks like the pricing is the same when you convert currency, so it likely doesn't make a difference which vendor you book through. There are many tours to Montserrat from Barcelona, and you can even take the train on your own, but we liked that this tour not only visits Montserrat but also includes lunch and a wine tasting. More on that later! We met up at Plaça de Catalunya where we were directed to join our guide Miguel and the rest of our small group. We would be sharing our bus with a few other groups as we headed to our first stop. Along the way one of the guides on our bus gave us a super funny run through of Barcelona's history. We finally arrived at Montserrat, where we had a 45-minute guided tour of the area with Miguel followed by an hour of free time (more than the tour description lists, which was nice). The mountains themselves are beautiful, truly a sight to behold. The monastery grounds are quite expansive. Miguel showed us several hotels located right by the monastery where many people come to stay so they can spend several days exploring the area. As you can imagine, having limited time here can have its disadvantages. Even though we had an hour of free time that was nowhere near enough time to wait in line to touch the famous Black Madonna. 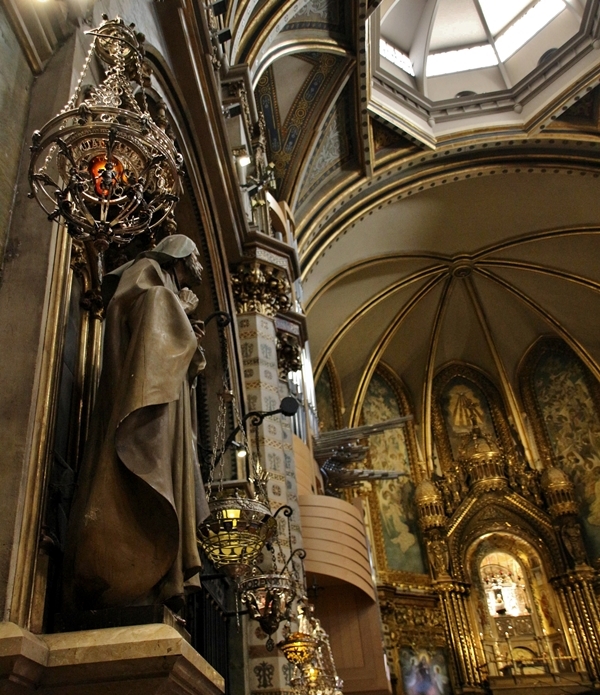 We did learn that the pipes in the basilica are by the same maker as those in Sagrada Familia. Pretty cool. Luckily we were able to light some candles during our free time. 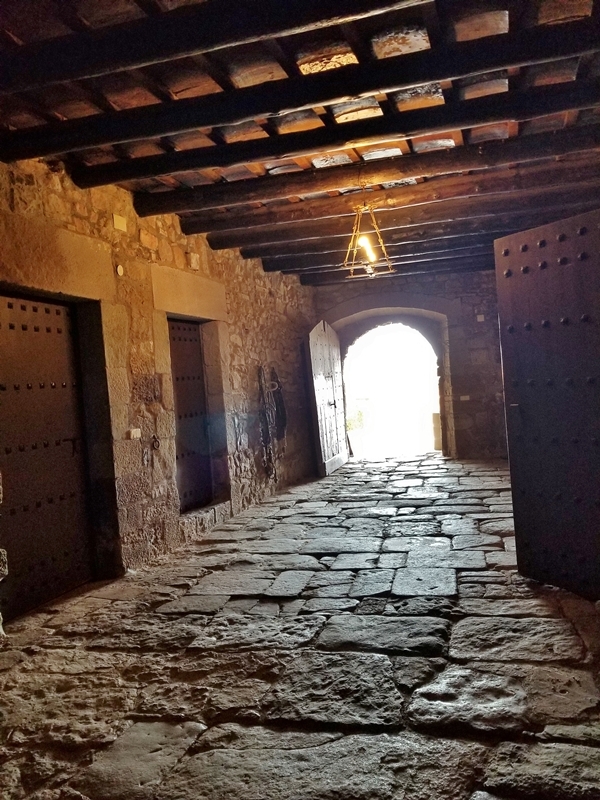 I also highly encourage anyone who does this tour to grab a snack at one of the cafes here at Montserrat, because you won't be eating your tapas lunch until after the wine tour. Lucy and I shared an Iberian ham sandwich, so we had something to hold us over until our late tapas lunch. On our drive from Montserrat to the Oller del Mas vineyard we passed this eerie stretch of land which was the victim of a 3 day long fire in July 2015. Firefighter Marc Sellares later returned to the area and carved 1,200 crosses out of the burned trees. It's now called El Bosc de les Creus, or the Forest of Crosses and serves as a memorial to the lost woodland. Honestly it's pretty creepy but also pretty cool. It felt very Tim Burton-esque. 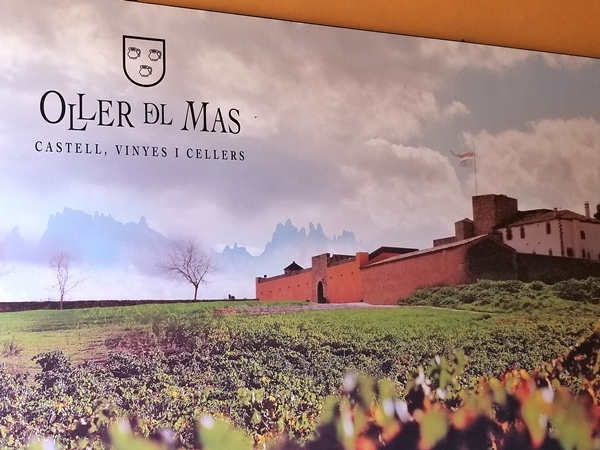 Finally we arrive at Oller del Mas, a vineyard, wine cellar, and 10th century castle half an hour from Montserrat. The castle was founded in 964 AD, but many parts were rebuilt after Napoleon's reign. The current owner Frank is the 36th generation of the same family running this vineyard. And it is a stunning piece of land, with an even more stunning view of Montserrat. This is a chateau winery, meaning all of the wine making steps are done here onsite. Also all the wines made here are ecological aka organic. 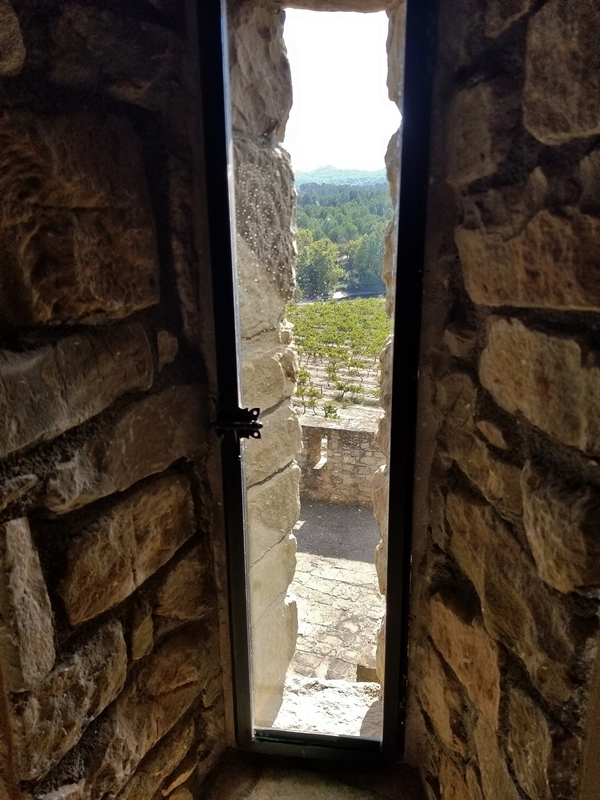 After a tour of the castle where we learned a bit more about aging the wines (all done in French oak casks, which are milder than other oaks), and a look at the view from the roof top, we sat down for our tapas lunch and wine tasting around 1:30 pm. There were a couple different options for this tour. One included a multi-course meal, and the other a lighter tapas lunch. Honestly, the tapas were quite satisfying, however it didn't hurt that we also ate a sandwich earlier at Montserrat. The tapas in general were quite good. My favorites were the two with the meats, the Iberian ham and the hard sausage. The bite of tortilla española was also really great! It had crispy onion on top which added a nice added bit of flavor and texture! The tuna was my least favorite as it was the least exciting, and probably could have used a touch of acid. Miguel suggested we drizzle the winery’s olive oil over everything, and that was a great suggestion because the olive oil was top notch. There was also a dessert, which reminded me a bit of tres leches cake, as it seemed like a sweet milk-soaked cake, but I'm honestly not sure what it's called. 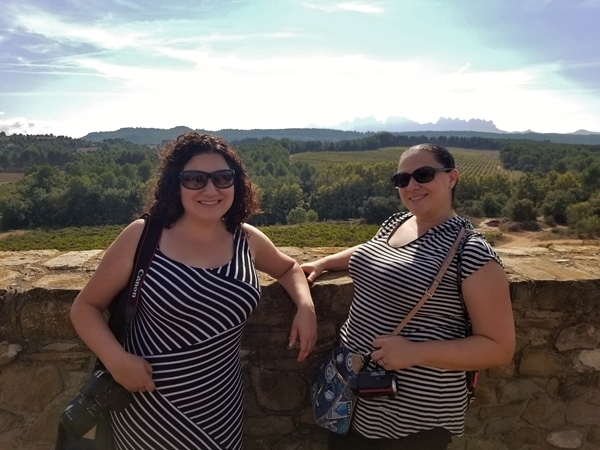 While we pecked at our tapas, we learned that there are 69 wine regions in Spain, with about 14 wineries in this particular region at the feet of the Montserrat range, D.O. Pla de Bages. 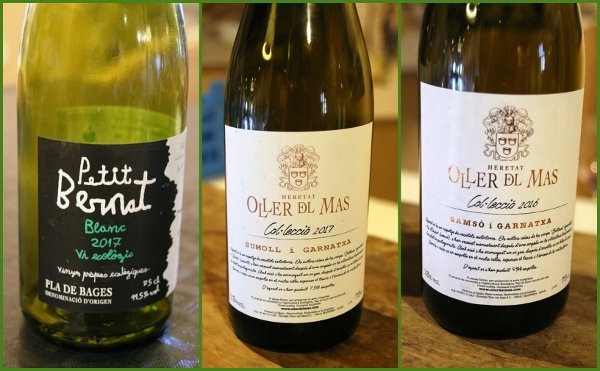 We would be tasting 3 wines from Oller del Mas, a white and a couple reds. 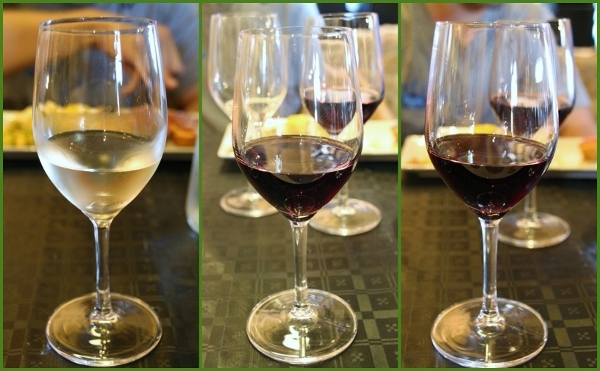 We also tried out a bit of wine science, and learned to use the flashlights on our cell phones to tell whether our red wines were medium or full bodied. There were some funny folks in our tour group. At one point when Miguel asked what we smelled when sniffing one of the reds, a guy from California loudly stated "I smell October." That's pretty accurate, I guess! After a fun and informative meal and wine tasting, we headed back to the bus for our drive back to Barcelona, but not before meeting Vino the family dog! Yes, his name is Vino! I happily would recommend this tour to anyone who a) is interested in checking out Montserrat, but maybe doesn't need or want to spend an entire day there, b) loves wine, c) wants to do a wine tasting in a 10th century castle slash vineyard, and d) loves having fun! After getting dropped off where we started our day, at Plaça de Catalunya, we grabbed a quick café con leche at Farggi Cafe for a little pick me up before continuing with our afternoon. So apparently this particular day, October 12, was a National Holiday in Spain called Spain Day. We were told it was the one day of the year where you would see lots of Spanish flags in Barcelona, since most of the folks there don't really identify themselves as citizens of Spain but rather citizens of Catalonia. The Catalonia flag is much more prevalent in Barcelona than the Spanish national flag. We saw some people parading around and carrying flags, and statues adorned with Spanish flags and stickers. 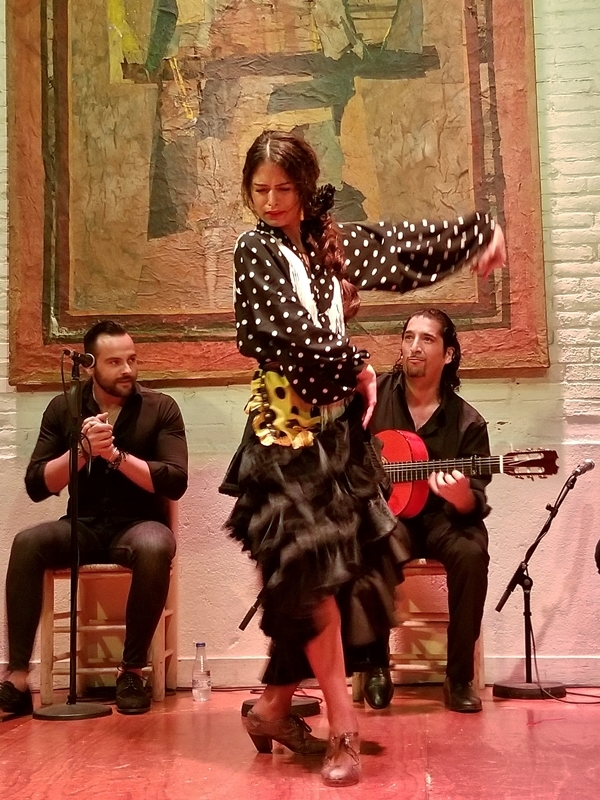 Dinner tonight was pre-booked and pre-paid at Tablao de Carmen for their Flamenco Tapas Dinner. Tablao de Carmen is actually located inside Poble Espanyol, an open-air architectural museum originally built for the 1929 Barcelona International Exhibition (World's Fair). It contains 117 full-scale buildings representing 15 autonomous communities of Spain − Andalusia, Aragon, Asturias, Cantabria, Castilla-La Mancha, Castilla y León, Catalonia, the Valencian Community, Extremadura, Galicia, the Baleric Islands, the Community of Madrid, the Region of Murcia, Navarre, and the Basque Country. 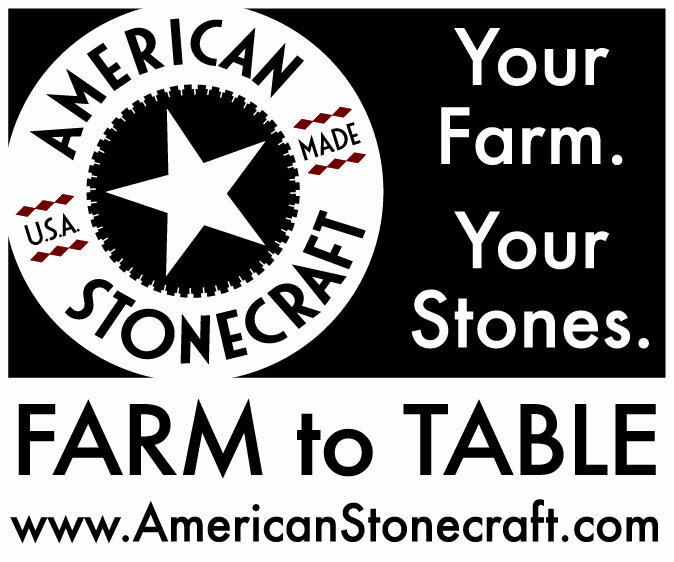 It also includes a theater, restaurants, artisan workshops and a museum of contemporary art. 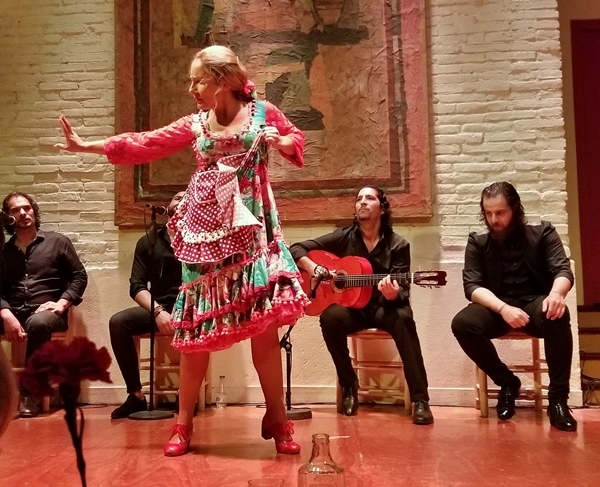 At the time of this post, admission to Poble Espanyol costs 12,60€ for adults, but with an advance booking at Tablao de Carmen you get free admission! For our 6 pm booking, we could arrive as early as 4 pm, but were closer to around 4:30 by the time we made it. 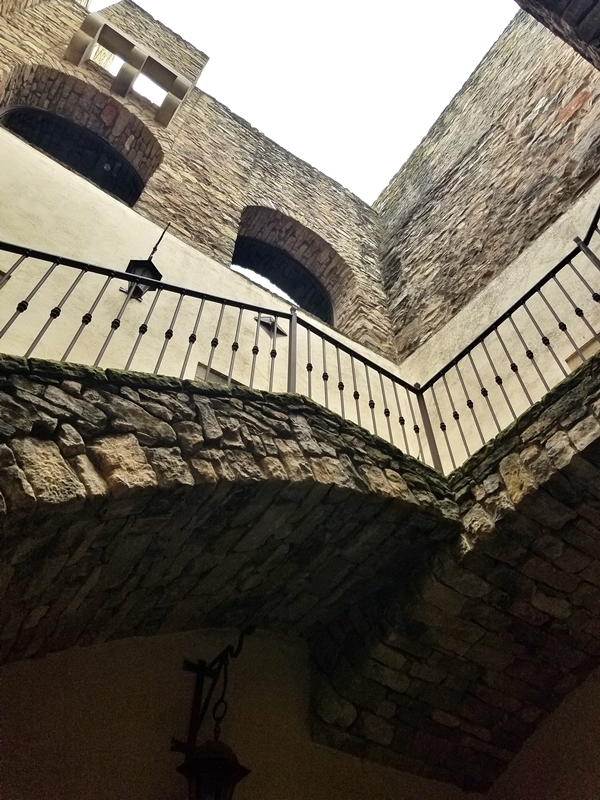 That gave us a decent amount of time to explore and shop, however Lucy and I totally fell in love with Poble Espanyol and would have enjoyed more time here, as well as use of the audio guides which I'm sure share a lot more about all of the gorgeous buildings. We definitely missed certain parts, but hope to come back someday to check it out in even more detail. Perhaps my favorite building here represents the Arcos de la Frontera village in Cádiz, in Andalusia. Holy whitewashed buildings. I just couldn't get enough. It was just SO beautiful. There are also little exhibits with videos for each geographical region of Spain: North, Center, South, and Mediterranean. The one representing the south was full of orange blossoms, and was just so fragrant and spectacular. As luck would have it Tablao de Carmen is located in my favorite building, the Arcos de la Frontera. Our table was front and center, and quite close to the action. 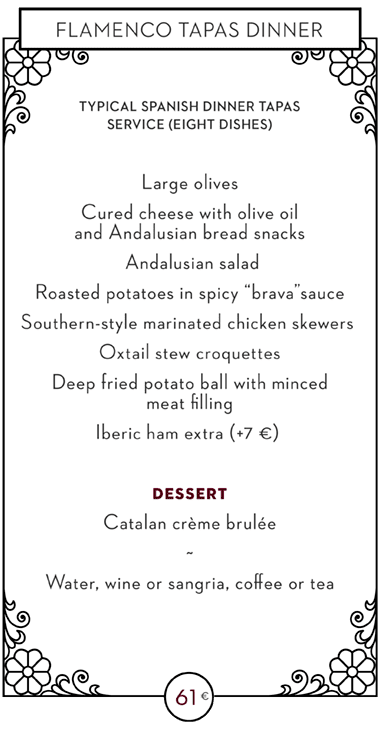 As I mentioned earlier we opted for the Flamenco Tapas Dinner, but there are heartier (and more expensive) options as well. We thought the tapas menu offered more than enough food to satisfy us, and the more extensive menus in retrospect would have been way too much food. Let's take a look at our spread. First and foremost, we shared a liter of sangria, because that's the way we roll. Throw in some jumbo green olives, and we're off to a good start. The next round of food consisted of patatas bravas (these were basically drowned in sauce, a little overwhelming, it was our least favorite rendition of the dish this week), oxtail stew croquettes (neither of us really loved these, they were ok), and bombas aka deep fried potato ball with minced meat filling (they were quite good although nothing would compare to the bombas we enjoyed earlier this week). Southern-style marinated chicken skewers followed, and were topped with a drizzle of mild allioli (not too garlicky). These were tender and pretty decent. Nothing life-altering here, but for chicken skewers and a much needed protein component to the meal they fit the bill. Last but not least, dessert arrived during the show but I'll share it now. This Catalan custard is reminiscent of French crème brûlée, and offers a nice finish to the meal. Overall we thought the food was mediocre in comparison to the tapas we enjoyed throughout the week at other restaurants. However, we weren't here just for the food. It was all about the entertainment! What can I say about the entertainment here? It was seriously so mesmerizing and fabulous! This is why we were here on our final night, for this experience. We couldn’t understand the lyrics to the music, but our neighboring table spoke Spanish and told us that they are depressing songs about heartbreak, hence all the drama and angry stomping. What a fantastically fun show! There were 2 singers, a guitarist, 2 female dancers, and a male dancer who each performed separately and then did a finale where they all took turns and occasionally danced together. We loved it! I would highly recommend this place. What a night! And there's still more to come! As we headed out from Poble Espanyol we noticed these bright lights in the sky. My guess was that they had something to do with the Magic Fountain of Montjuïc nearby. Yep, you heard me. A Magic Fountain. It was commissioned for the International Exhibition (or World's Fair) in 1929, and was restored for the 1992 Olympic Games. A short walk from Poble Espanyol, we discovered we were right. We arrived around 8:20 pm, 40 minutes prior to showtime. The Magic Fountain show schedule varies depending on the time of year, but at the time we visited (October) it only occurred on Thursdays, Fridays, and Saturdays from 9 pm to 10 pm. What a great way to end our week in Barcelona! We only stayed for about 20 or 25 minutes of the hour long show, because we were already quite exhausted from the day, had to finish packing, and didn't want to get stuck in a massive crowd leaving all at once. Walking from the Magic Fountain to Plaça Espanya to catch the Metro... oh the crowds!